Embers of a fading world? Or embers of hope for a beautiful new Arctic dawn? Glowing Embers of Ice is the first in a series of narrative paintings by Anita Young in which she uses visual imagery, symbolism and reflective commentary to explore some of the issues affecting the natural world today. In our ultra-fast-moving human world of instant communication, where brevity and speed are increasingly given precedence over all else, the series Pictures of a Thousand Words was inspired by a wish to encourage the viewer to allow themselves a contemplative pause in which they can absorb the message with both heart and mind. It is hoped that the painting Glowing Embers of Ice will itself convey a visual story which can be interpreted by each individual in their own way. But it is also hoped that the powerful accompanying narrative will help to encourage a deeper understanding of the challenges faced by our fellow creatures using a language in which they themselves are not able to communicate. The wolves featured in Glowing Embers of Ice are based upon the beautiful Arctic wolves in the care of The UK Wolf Conservation Trust and of Wildpark Alte Fasanerie, Germany. At least 10% of net proceeds from all prints sold will be donated to wolf conservation. will be donated to wild wolf conservation. 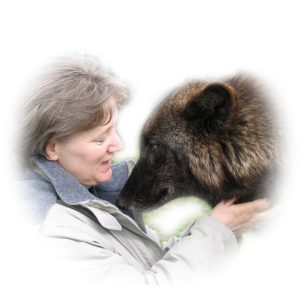 If you are interested in seeing and learning more about Arctic Wolves, then please visit . . . .